Sacred words are becoming a dying language, according to Jonathan Merritt. But in the words of Monty Python, they are “not dead yet” and we can revive them. Words matter. As I writer, I believe this to my core. 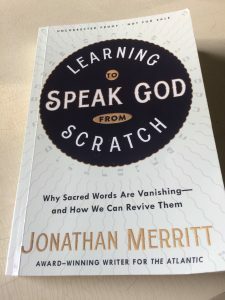 Jonathan Merritt’s forth-coming book, Learning to Speak God from Scratch, is not just a critique of Christian-eze platitudes or clichés. Far from it. Jonathan, who is an amazing writer, is also a fastidious researcher. He was intrigued by an article which asserted that the use of words like grace, mercy, faith, sacrifice and so on were declining in the national conversation. He teamed up with Barna to survey 1000 people on the frequency of spiritual conversations. Jonathan found that the language of faith is on the decline, in part because we don’t always know what we mean when we “speak God.” He also learned that more than one-fifth of his survey respondents said they have not had a spiritual conversation at all in the last year. About 7 percent said they talk about spiritual matters no more than once a week. Learning to Speak God from Scratch is based on research, but Jonathan’s excellent reporting on that research is woven into the story of his move to Brooklyn, NY, where he found that very few people “spoke God” and when they did their words might mean something entirely different. The narrative of Jonathan learning a new city, even as he re-learns language, keeps the book moving forward and makes it readable and relatable. The book explores a number of specific “God words” such as prayer, pain, disappointment, mystery, etc. Each gets its own chapter where Jonathan explores not only the word, but the idea behind it. The book reads like a conversation with a really smart (he’s got two graduate degrees) and kind friend. My favorite chapters were the ones on Spirit and Family. They’re grounded in solid scholarship but challenge the status quo. Brilliant. Intrigued? Order the book now. I had the pleasure of hearing Jonathan speak at this year’s Festival of Faith and Writing. He was brilliant and witty and articulate. So of course when I saw him in the lobby at the end of the festival, mildly stressing about the impending snowstorm like the rest of us, I had to fan-girl a bit and say hello (and gush about how much I enjoyed his talk). He generously offered me a copy of his book, which I promised to read and review (and buy for all my friends). I’ve already pre-ordered more copies, because I know plenty of folks who will, like me, just love this book. A book’s pre-orders, before it even releases, often determines its success. So don’t wait. If you think you might want to buy it when it comes out–don’t wait! Go pre-order Learning to Speak God from Scratch here. And visit Jonathan’s website to learn more about him.